The department has committed to improve safety along its transport networks and to provide some practical responses to recent incidents of object throwing. Safety improvements that include infrastructure upgrades and security initiatives are currently underway along the Southern Expressway. CCTV upgrades on nine bridge sites (with remaining sites completed by end October 2018). Rock capping (mesh covering) near Honeypot Road and Beach Road bridges (with all mesh installations at bridge sites planned to be completed before the end of December 2018). Installation of numbered signs on each bridge along the Southern Expressway to enable easier reporting of alleged instances of object throwing to SAPOL. Temporary anti-throw Screens installed at all bridge sites. Installation of permanent anti-throw screens as part of DPTI’s commitment to improve safety along the transport network and to provide a practical response to the incidents of object throwing. Weekend works commenced Friday, 7 December 2018 and are expected to be completed by late February 2019, weather permitting. Weekend works will commence Friday, 15 February, and are expected to be completed by Tuesday, 19 February, weather permitting. 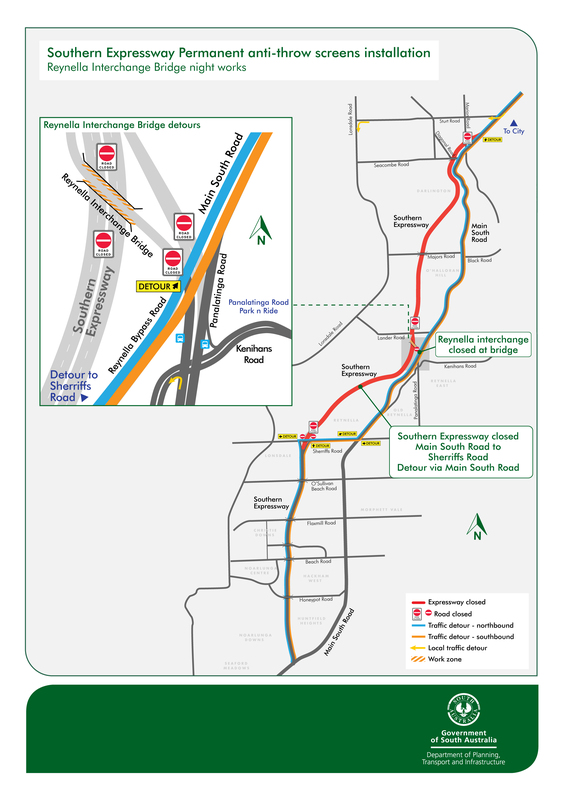 Local traffic diversions will be in place at the Reynella Interchange. These local diversions are shown in yellow on the attached map. Motorists travelling south on the Expressway will be detoured via Main South Road and will be able to access the Expressway from the Sheriffs Road Interchange. This diversion is shown in orange on the attached map. Northbound motorists need to exit via the Sheriffs Road Interchange and continue using Main South Road. This diversion is shown in blue on the attached map. Road users are advised to follow the direction of traffic management staff and observe VMS boards and local traffic management signage. Pedestrians and cyclists will be detoured to nearby pedestrian bridges or road bridges. Existing bus routes will continue to operate as normal and will not be diverted. Access to businesses and properties will be maintained at all times. Residents and businesses will continue to be updated by individual detailed notifications ahead of all bridge installation works. To register to receive project information and updates or if you would like to speak to a member of the project team: please call 1300 282 933 or email dpti.regionalbridges@sa.gov.au. Anyone who witnesses the throwing of objects or suspicious activity around the Southern Expressway should contact the Police Assistance Line on 131 444 at the time of the incident so police can attend. The department is continuing to work closely with SAPOL, local councils and other stakeholders on all safety measures associated with such incidents. We appreciate your patience and cooperation whilst these important works are undertaken.